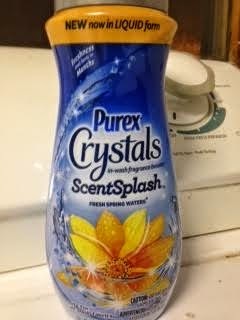 There is a new product by Purex called Purex Crystals Scent Splash. This is an in-wash fragrance booster that gives your laundry a fresh smell for months! How cool is that? I just used it for the first time today, and I know my fiance is going to love the smell. He prefers laundry to have a fresh scent, and my allergies prefer it not, so this is perfect for us because I only have to buy one laundry detergent, and as long as I keep this on hand, we both can be happy! Plus I love smelling fresh laundry, just not to wear things laundered with a scented product because of allergies, so this is great! I can enjoy the smell of his clothes as they come out of the wash, and as I fold them! Plus it helps eliminate laundry odors -- even on nasty smelling socks! I've tried the Purex Crystals before, but this one is in LIQUID form. I liked the Crystals, but this seems to allow you a stronger scent, so this is my personal pick over the Crystals. Fresh Spring Waters, Fresh Lavender Blossom, and Fresh Mountain Breeze. This is a great product, and one I know we'll buy again and again. And now for the giveaway: USA only, one entry per day per person. Winner has 48 hours to respond to winning e-mail or another winner will be chosen. 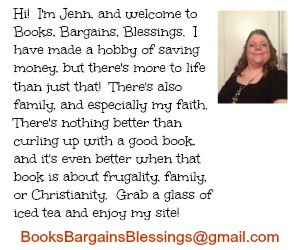 Giveaway ends April 5, 2015. Winner will receive TWO coupons for totally free Purex ScentSplash. I want to try the Fresh Spring Waters scent. I'd love to try Fresh Lavender Blossom. I would love to try Fresh Lavender Blossom please. Sounds wonderful! kristiedonelson(at)gmail(dot)com Thank you. I would love to try the Fresh Lavender Blossom. I absolutely love the scent of lavender so, the Fresh Lavender Blossom would be my first choice. I most want to try Fresh Lavender Blossom. I most want to try the Fresh Lavender Blossom. I'd like to try the Fresh Mountain Breeze. It sounds like it'd smell absolutely amazing. I'd love to try the Fresh Spring Waters scent. I want to try Lavender blossom. I'd like to try Fresh Mountain Breeze. I want to try the Fresh Lavender Blossom. I think I would love the Fresh Mountain Breeze scent. I love how relaxing Lavender makes you feel so I would love to try the Fresh Lavender Blossom scent. I want to try Fresh Mountain Breeze.